The McCarran International Airport is the primary commercial airport serving Las Vegas and Clark County, Nevada. In 2010, the airport recorded an estimated 39 million passengers passing through the terminal. With the growing need for expansion, the McCarran Airport Authority devised a plan for a new air traffic control tower to accommodate a terminal radar approach control (TRACON). Doka’s formwork solutions were chosen for the construction of the air traffic control tower because of their ability to provide efficiency and safety. Having previously used the Super Climber on an 243,840 m² condo project in Chicago, Ill., the contractor, Archer Western, felt the Super Climber would be a good fit, in combination with Doka’s SKE50 plus. 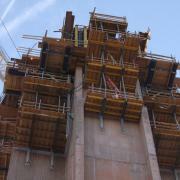 Doka’s Super Climber system, in use on the interior walls, is supporting high live loads on the main work deck. By raising the entire working deck and formwork from floor to floor with a push of a button, the Super Climber allows fast and safe construction. A hanging stair tower is also integrated into the Super Climber. This five-story stair tower was built with Doka’s Staxo 100 to allow the carpenter safe access to the top of the forms and climbing system. Climbing the outside walls, Doka’s SKE50 plus provided a versatile solution. The SKE50 plus is a new system and is being used for the first time in the U.S. on the McCarran Airport project. With features including automatic brakes and a spring loaded suspension wedge to eliminate manual placements on the climbing shoe, faster completion time and maximum safety are possible in all phases of the project. The exterior walls feature an architectural finish that varies at random plank depths, uses fair-faced formliner concrete, and will change colors three times. 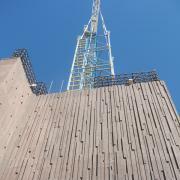 The special pattern formliners were supplied by Doka and attached to the Top 50 formwork. Pour heights reached about 5.8 m high with the system. 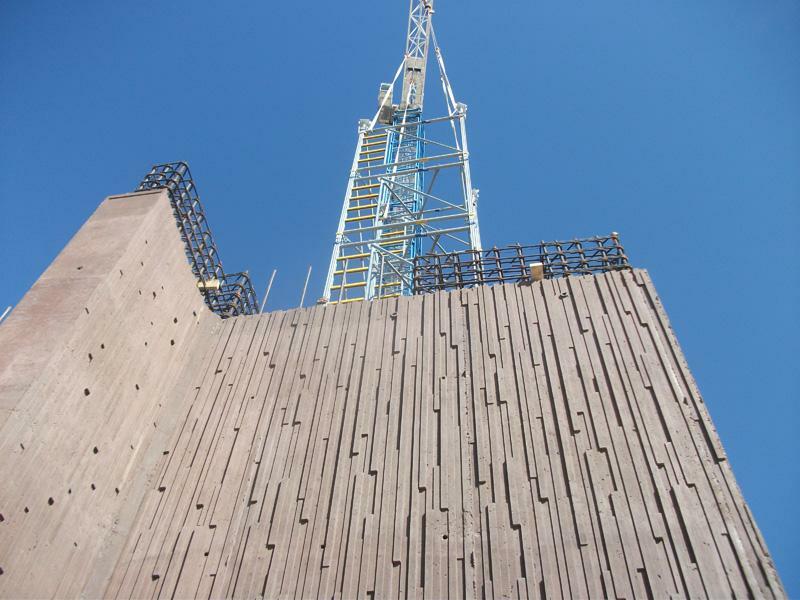 For each lift on this project, more than 3,657 m² of formwork is in use. Changing conditions will require the SKE50 plus to be removed at level 14 because of a slab projection, but the interior core will remain intact. 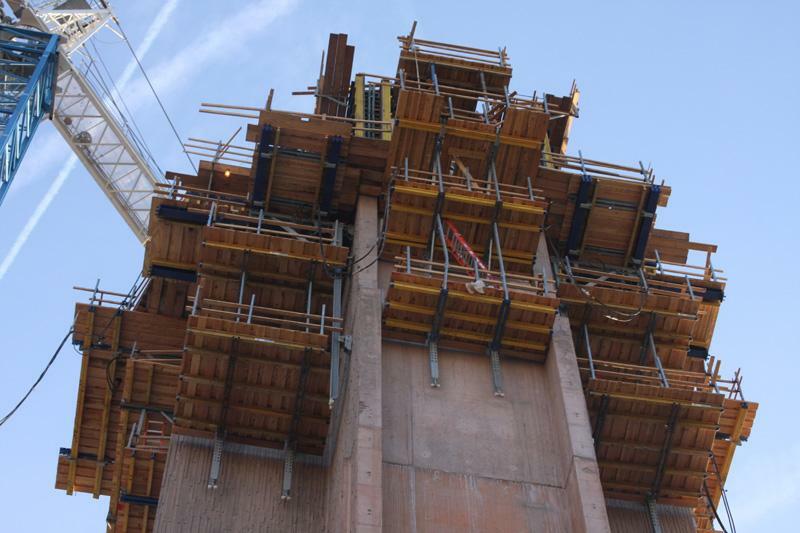 With 23 lifts on the project, there is an overall height of 108 m. In addition, the unique design of the flared wing walls, on all four sides, not only made this a challenging formwork job, but it will help make the air traffic control tower at McCarran one of the most modern looking towers in the country. Thank you for your interest - Self climbing system debuts in Las Vegas. Thank you very much for your interest - Self climbing system debuts in Las Vegas.